A wise man once said “to eat is a necessity, to eat intelligently is an art” – and there is no more intelligent choice than salad! With a wide array of colors, flavors and textures, salads bring together some of the best bounties of nature in one bowl. The nutrition-packed ingredients, accentuated by the creatively diverse mixes, place salads firmly at the top of the ‘good-for-you’ food list! But when it comes to Jeddah, which salad-serving restaurants made it to the favorites’ shortlist? A sensually addictive salad is the Vito’s Salad at Toasted. With bresaola and grilled chicken slices, spiced up with a delectable lemon-mustard dressing, this salad is guaranteed to entertain your taste buds and thoroughly satisfy your appetite. In general, salads at Toasted are refreshingly gourmet, with balanced mixes difficult to find anywhere else. Another popular one is their Classic Italian Salad; it is a wild mix of strawberries and pine nuts on a bed of lettuce and rocca , seasoned with balsamic dressing. Toasted is the best place to order or pick up salad from; it is fresh, delicious and convenient. It’s extremely popular with the young working crowd who are looking for a clean, healthy snack to have at the office or on-the-go. Le Notre’s recipe for Nicoise Salad is definitely a secret one; their version just goes beyond the familiar Nicoise salad flavors. The freshness of the ingredients is surely part of the secret; the artichokes for example, are a delicacy on their own. The salad is enhanced by the tasteful add-ons such as the olive tapenade, the baby new potatoes and the croutons. Their Crispy Noodle Salad with ginger and soya sauce and the mouth-watering Citrus Gambas Salad are two other popular salads at Le Notre. With more than 10 haute cuisine salad platters beloved by Jeddah’s fine diners; diners regularly find themselves ordering salads as entrees. The exquisitely European essence in these salads elevates the eating experience beyond sensational – considering their tantalizing presentations, it is clear that Le Notre truly believes in the saying that “our eyes eat first“. If you are fond of rich salads, in both size and flavor, you will find the Cajun Chicken Salad at Salad Boutique difficult to resist. Each ingredient in this salad brings its own distinctive flavor, emerging together into one delicious medley. Cajun chicken, tomatoes, lettuce, eggs, croutons and cheese all showered with a honey-mustard dressing combine into this flavorful dish. Another filling salad with almost the same level of pungency is their New York Steak Salad. On the lighter side, Salad Boutique offers a decent range of ’green’ salads, like the basic Green salad or the Pomegranate. The menu divides salad offerings into five distinct categories: Green, Pasta, Chicken, Beef and Seafood salads. Salad Boutique is the only restaurant in Jeddah that specializes in salads and serves them as a main dish rather than an appetizer; they make this a clear statement with their portions! This ‘boutique’ is definitely one place that treats each salad platter as a fine piece of art. The colorful mélanges appear so picture-perfect, that you almost feel guilty to dig in and spoil it. For a truly wholesome and appetite-fulfilling salad, drop by Cilantro Café and order the Chef Salad; it is basically known as ‘the salad that has it all’. 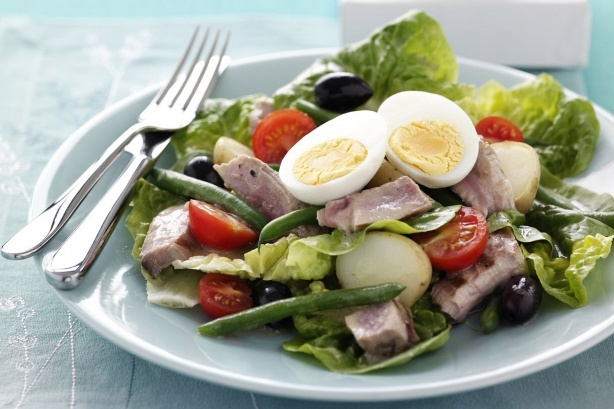 With grilled chicken breasts, slices of roast beef, olives and eggs lying on a bed of lettuce, this salad is ideal for weight watchers who want a nutritiously filling snack. A side dressing is offered to add some flavor, but if you are counting calories, you might consider having it plain. The Mixed Seasonal Salad is the healthiest option at Cilantro, with no meat ingredients and a light vinaigrette dressing. In fact, the food items on the menu, be they soups, sandwiches or salads, are all fresh, flavorsome and nourishing, leaving no traces of guilt after being devoured. With the concept of ‘appetite for life’, Cilantro presents a cohesively health-conscious menu that includes delectably balanced items, with insightful new additions every now and then. Feeling almost homemade, the Greco salad at Panino’s comes with the conventional ingredients, largely cut, tossed with tasty feta cheese and olives, and a mouthwatering vinaigrette dressing on the side – it easily ranks amongst the top Greek salads in town!. Other popular salads are the San Remo, which is a pasta salad, and the Grilled Halloumi Salad, with flavorful accents from sundried tomatoes and their lemon herb dressing. In fact, Panino’s blends some of the best dressings in town; their balsamic, vinaigrette and lemon herb versions top the list. Although this place is widely known for its scrumptious sandwiches, it offers some fantastic salads that are not getting the deserved spotlight. If you haven’t tried Panino’s salads yet, drop by the closest branch and pick one up; you will realize that you may have underestimated their menu! Mediterranean Tuna Salad; they are both guiltless delights. And if you are up for a wild experience, try their new Watermelon and Blue Cheese salad – the sweet-bitter gusto will definitely perk up your taste buds. Salads at Uptown 966 are served in a sizeable white bowl, giving enough space for each ingredient to stand out and display its features. Each salad is prepared with artistic color coordination, mixing just the right vegetables to visually trigger any appetite. Salads at this ‘uptown’ eatery are mostly ordered as main dishes or sharing entrées; and there is quite a generous range in the menu to select from. Uptown 966 is one of the few places that manages to confidently tick both boxes: health and appetite. Semsom’s Tabbouleh Feta has created a lot of buzz around town, considering that not many dare to mess with the classic tabouleh recipe. However, their chef knows exactly what he is doing, as adding the feta cheese to the tabouleh pulls together an unpredictably flavorsome salad. Yet for those who prefer the more familiar version, Semsom serves both the traditional tabouleh and fattoush prepared to perfection. Semsom is an inventive, modern restaurant serving familiar Lebanese dishes with a novel touch. Salads are standard orders in any Lebanese restaurant, garnishing the tables next to the hummus, vine leaves and the other common entrées; and although most Jeddah diners know the taste of these salads by heart, this creative Lebanese restaurant makes their salads their signature items with a special ’twist’. 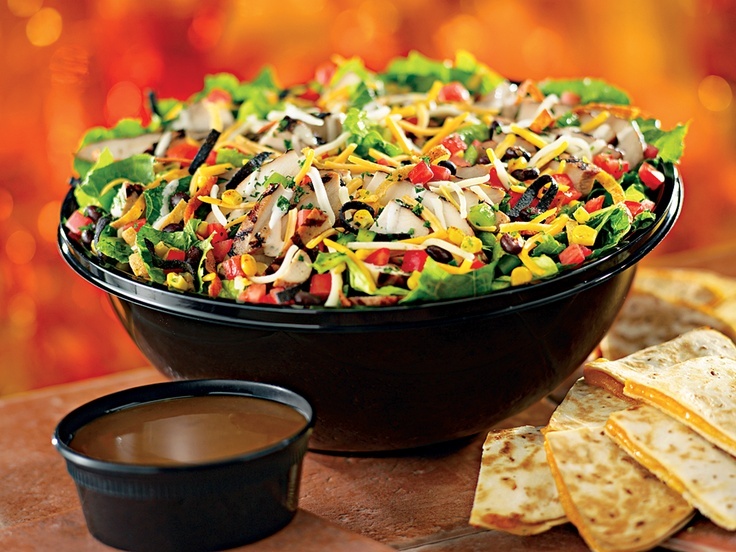 Though it is not the first restaurant to come to mind when thinking of salads, but Chili’s serves one unique dish not found anywhere else; the Quesadilla Explosion,, which is their signature salad. Generously served, this salad is literally exploding with appetizing ingredients that entice you to delve in and start munching. Chicken, corn, tortilla strips, beans and cheddar cheese are all tossed over a bed of lettuce, drizzled with ranch dressing; a balsamic dressing is served on the side if you want to add some tang. Surrounding the salad are four pieces of cheese quesadillas to relish with your salad mixture and complement your meal. Considering the portion size and the ingredients, this salad is definitely not an appetizer or a side order; it could be equal to a pasta serving or a burger in terms of calories and substance. The Spicy Crunchy Tuna salad at Zn Lounge has created a buzz in Jeddah, with mixed textures and a delectable zesty dressing. Soft pieces of tuna are jumbled with crunchy bits and seasoned with an Asian-infused, spicy dressing, bringing to diners an exotic eating experience. Zn Lounge serves some of the most sensational salads in town, with authentically wild ingredients and intense seasonings. Another exclusive delight on their menu is their Crunchy Salmon Salad, delectably fresh and flavorsome. Along with pleasing your taste buds, Zn Lounge brings joy to your eyes with their stimulating presentations and artistic garnishes. For those who especially savor their personal touch in food, Nafoura Restaurant has a side station serving Caesar salad ingredients prepared for them to mix their own version of this salad. Lettuce, shredded cheese, croutons, shrimps, chicken, and Caesar dressing are all appetizingly displayed on the station, enticing diners to mix as preferred. As for the actual salad buffet, it features a selective assortment of Mediterranean salads blended to perfection. The tabouleh, for instance, is not missing a tinge of lemon or a grain of salt, it is just right. Besides the typically expected salads and mezzas, the station includes other tasty delights like a potato salad, green bean salad, and artichoke salad. Salad buffets in general are quite tricky, especially when it comes to quality and freshness; but at the Nafoura Restaurant, there is no cause for concern. They are known to consistently display one of the finest salad buffets in town, focusing more on quality rather than quantity.